As Dr. Haider states, “It is less complicated and less expensive to preventatively treat based on a preventative diagnosis than it is to wait for things to break, then treat”. Dental X-rays have come a long way. 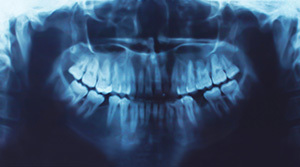 Today's dental X-rays are safer, faster, more comfortable and more informative than the X-rays of years past. Digital X-rays, one of the latest and most advanced dental technologies, produce high-quality images of your teeth that can be viewed instantly by you and your dentist on a LCD monitor. Digital X-rays reduce radiation by up to 90% and provide exceptional diagnostic information to ensure that potential problems are caught in their earliest stages. If decay or a deteriorated filling has caused a tooth to further deteriorate, sometimes an intermediary product is necessary. Inlays and Onlays are used when less drilling is required than for a crown and more drilling is required than for a filling. These products closely restore the tooth back to it’s natural form and function. A dental crown may not make you feel like royalty, but it is one of the premiere treatments for teeth with extensive decay or damage. Dental crowns can also used to hold a dental bridge in place, cover misshapen or severely discolored teeth, or cover a tooth after a root canal procedure. Made of either porcelain-fused-to-metal, ceramic or gold, dental crowns are placed during a multi-step process and sometimes require more than one dental visit. The first step is a dental impression. A temporary crown is then placed to protect the tooth while the impression is sent to an off-site laboratory to create the final restoration. In some cases, same-day crowns are possible, so be sure to inquire. With good oral hygiene and minimal wear and tear, your beautiful new dental crowns can last 15 years or more! Although dental crowns can be made of a variety of materials, including stainless steel, gold and silver, nothing looks better than a porcelain dental crown. Porcelain dental crowns match the natural color of your teeth and are virtually undetectable by the naked eye. And because they’re metal-free, porcelain dental crowns are an excellent option for patients with metal allergies. Best of all, porcelain crowns don’t just look beautiful – they’re strong, durable and long-lasting! There are three types of dental bridges: 1) traditional dental bridges, 2) cantilever dental bridges, and 3) Maryland bridges. Traditional bridges have either dental crowns or dental implants on either side of the missing tooth, plus a replacement tooth, which is held in place by a post-like structure called a dental abutment. Cantilever dental bridges are used in cases where there are surrounding teeth only on one side of the missing tooth. Maryland bridges are made of a specialized resin that is cemented to a metal framework and cemented to the enamel of surrounding teeth. Dental bridges typically take 2-3 weeks to complete and are less invasive than other options, such as dental implants. With good oral hygiene and regular dental visits, dental bridges can last up to 15 years or more! When it comes to “invisible” braces, Invisalign/ClearCorrect braces are the gold standard. Unlike traditional dental braces, which use brackets and wires to straighten teeth, Invisalign/ClearCorrect braces use a custom-made series of clear plastic aligners that are completely removable. The comfort and convenience of Invisalign/ClearCorrect braces are unbeatable. You can eat whatever you want; you can remove Invisalign braces whenever you need to; and you can brush and floss more effectively. Invisalign braces are effective for patients who have problems with crowding, spacing, crossbites, overbites and underbites. Dental implants are an extraordinary blend of science and art. Made of titanium, dental implants are securely anchored into the jaw and serve as roots for dental crowns. In many cases, dental implants – and mini dental implants, the smaller version — are considered the best option for replacing missing teeth. They are also used to replace dental bridges or partial dentures, or to provide support for dentures. Dental implants offer several advantages over other tooth replacement options. They look, feel and function just like real teeth! With dental implants, surrounding teeth are left untouched. Finally, dental implants are exceptionally reliable. Year after year, dental implants have had high success rates and typically last 15-20 years. Perio Protect is the non-invasive therapy for gum disease. Gum disease is caused by a bacterial infection that is hidden below your gums. Dental cleanings can effectively treat the bacteria, but when you return home the cycle often continues. Bacterial cells grow back in just hours after a cleaning, and toothbrush, rinse and floss can’t reach deep enough to address the infection at home. The Perio Tray by Perio Protect gently applies medication deep under the gums to fight the infections. You use it at home for just minutes each day. The Tray is comfortable, flexible, and custom-fit precisely for your mouth.